The forecast is on track with rain starting about 4-5 PM Saturday. High 44. For Sunday, chance of showers in the morning, then cloudy with a chance of light showers (NBM and GFS) in the afternoon. The NAM continues with a mostly dry and cloudy afternoon. High 63. An approaching low pressure system in the west with it’s associated warm front will pass through our area late Saturday evening into Sunday morning. Saturday will start chilly with a mix of sun and clouds with temperatures not warming to 40 until noon. Highs will be in the mid 40s during the late afternoon. Clouds move in during the afternoon Saturday and rain starts about 4-5 PM. Rain will become moderate during the evening and night. The warm front passes north of us early Sunday morning. The GFS and the NBM maintain some showers lingering into the afternoon, while the NAM has the possibility of rain ending around noon. It’s a tough call on whether we’ll have clearing in the afternoon, but I’m feeling the GFS may be holding onto the showers too long. High temperatures 63-67. Weekend Update – Like last weekend, it appears that the rain will arrive sometime mid to late Saturday afternoon. High near 49. Heavy rain Saturday night. Rain ends during the [late] morning on Sunday. High temperatures about 63 Sunday, but some statistical models are suggesting 67! Updates Friday evening. The overall weather pattern for Philadelphia over the next two weeks is for below average temperatures (average high about 49) with at least one 3 day warmup occurring over the coming weekend. Low pressure will bring a southwesterly flow of mild air for Saturday and especially Sunday. The statistical EKDMOS has a high of 60 for Sunday while the NBM shows a high of 58! Unfortunately, there’s a high probability of rain for Saturday, but Sunday afternoon may be dry. Too soon to be sure. Stay tuned. While the GFS LAMPS maintains high chance of rain arriving by 12-2 PM, the recent runs of the NBM show a slightly later arrival of the rain: 1-3 PM. A small change. Saturday will start cloudy and temperatures will rise from below freezing into the low 40s by 1PM. Arriving with the milder temperatures will be rain. The rain may arrive as early as 12-2 PM. The rain will become heavy late afternoon into the evening. Temperatures continue to rise into the 40s. The low pressure system that brought us the rain will be gone before daybreak Sunday. Sunday will be partly sunny and a bit warmer than average for this time of year. High 52. (Average high about 50). Outlook: Rainy on Monday and another outbreak of cold air expected by Tuesday, although not as cold as we’ve had the past few days. Tonight’s NBM model is showing a high temperature on Thanksgiving Day of 28 for Philadelphia! A dip in the jet stream is predicted for the coming week, with the coldest temperatures forecast for Wednesday night through Thursday night. 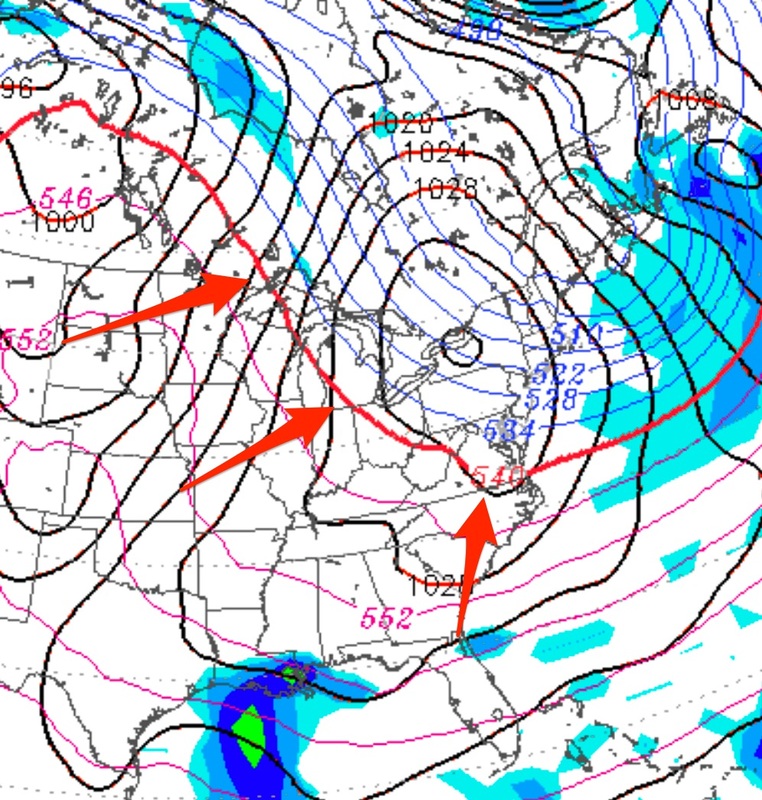 GFS Model Forecast for Thursday, (Thanksgiving) afternoon. The extended range GFS and NBM (National Blend of Models) shows a high of about 32 for Philadelphia on Thursday! Actually, that’s an improvement; the forecast dip was even more amplified just a few days ago. A warm up and rain is expected next Sunday or Monday, then a return to colder conditions sometime during the following week. I continue to feel we will have a colder than average winter due to the nadir in the sunspot cycle and a stormier winter as well, with plenty of moisture available in the southern jet stream from a developing El Niño in the Pacific. I first made this preliminary climate prediction a few weeks ago. Past information about the sunspot cycle’s influence on temperatures can be found here.